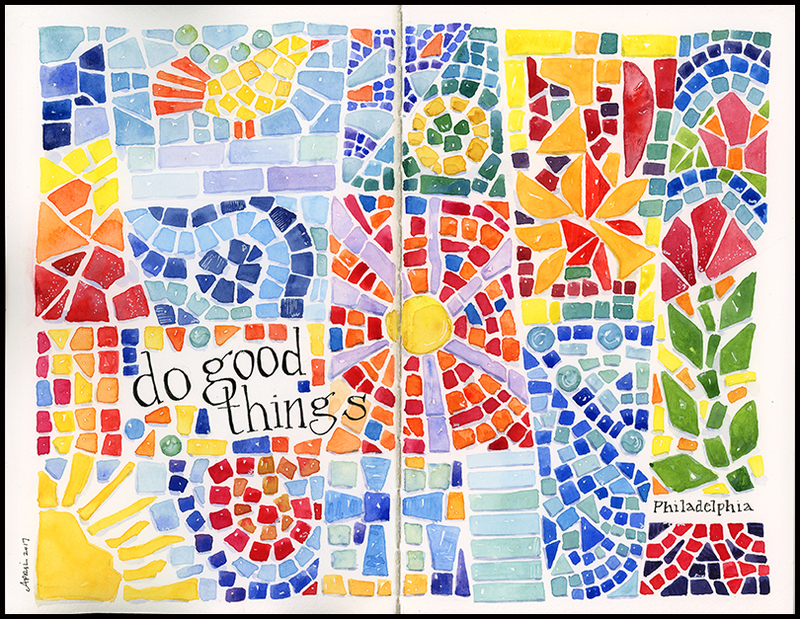 Inspired by fragments of glass and broken ceramics pieced together on a street corner in Philadelphia, I painted this page, along with the words written next to the original mosaic. All those colors, all those tiny broken fragments taken together create something bold and beautiful and compelling— what a great metaphor for life. This entry was posted in Journal and tagged mosaic, travel sketching by Jean Mackay / Drawn In. Bookmark the permalink. Jean I love your work this is fun and whimsical! Next time you are in Philly, let’s go see Philadelphia’s magic gardens and also the Tiffany/Maxfield Parish mural! Fun, Cinda- enjoy. It might be fun to do something like this with your students. this is beautiful. great use of colors. Thanks Stacey! It was fun to do something so bright and colorful. Totally lovely, lively and inspiring! Thanks Carole- I was able to test out some new reds in the process (pryrol scarlet and pyrol orange). It was good to experiment with bold colors– something I rarely do. Great Sheryl! It was fun to use a vibrant palette. Yep. It’s good to try something new every now and then and see what you learn. It’s a little slow going, but fun just the same.